I was ready. After the false start on Saturday I was making my “proper” debut as a director. I was ready to press the flesh, making small talk with my fellow directors and basically being “directorial”. I have no idea what that means, but I am learning, one small step at a time. Bring on the important decisions about drain cleaning options. After the 4-0 defeat to AFC Hornchurch on Saturday I was not “gutted”, I was “disappointed”. It was all about the long term sustainability of the club, rather than just results on the pitch. I even understood the terms “Securitisation” for Pete’s sake – that is how much I had learnt in five days! After banishing my children to the bedroom for joining in the cruel chants of “Sack the board” on Saturday, I told them I was withholding their match fee (pocket money) for a week. As I prepared to leave the house, ready for a full day of communications in London before heading down to Lewes they gave me a letter, addressed to the Direkta (sic) of Lewes FC. “Dear Direkta. We are sorry that you are angre with us, the fans. We paid our money (No, they got in free!) so we can say what we want, innit. We hope you win tonit so we can have pocket money again. Luv The Little Fullers” I have a feeling there may have been the hand of CMF at work in there somewhere but at least I had some backing once again. Tonight Lewes welcomed “The Gate” into town for a “must win” game. Of course all games are must win, but after the defeat on Saturday it was essential that the Rooks showed their “bounce-back-ability” as quickly as possible. Few people know that Margate hold a unique piece of history in non league football. Back in November 1971 they were drawn against Bournemouth (& Boscombe as they were back then) in the FA Cup first round. It turned out to be a red letter day for one particular player, a day that would forever be etched in the history of the Cup. Edward John MacDougall lined up up front for Bournemouth on that day and ended up scoring nine times in a 11-0 win. Margate showed their own bounce-back-ability just twelve months later by reaching the third round of the FA Cup where they lost 6-0 at home to Spurs in front of an amazing 14,000. So what of the team today? Well, after the heady days as Kent’s premier Non League side during the last decade when they competed in the Conference Premier they found themselves falling foul of the good old ground grading rules (they weren’t actually playing at their own Hartsdown Park due to ongoing redevelopment work) and were forcibly demoted to the first to the Conference South and then again in 2005 to the Isthmian Premier League. Fifteen years ago I would be rubbing shoulders in the board room with Buster Bloodvessel. At the time the lead singer in Bad Manners owned a hotel in the town called “Fatty Towers” which catered for the “larger than life” guests and he agreed a deal for the group to be the shirt sponsors and in return Douglas Trendle (aka Bloodvessel) was asked on the board. Arriving at the ground things seemed a bit sparse. Not just in the bar but on the pitch. We could only count a dozen or so players warming up. Club Secretary Kev appeared with the team sheet, showing Lewes had named 14 players, including Christian Nanetti, who wasn’t yet at the ground due to Southern train issues. Welcome to the world of Non League Football. “Back the board, back the board, back the board” They chanted in unison at the final whistle. No, not the loyal Lewes fans but my two daughters down the phone when I rang to tell them we had won. 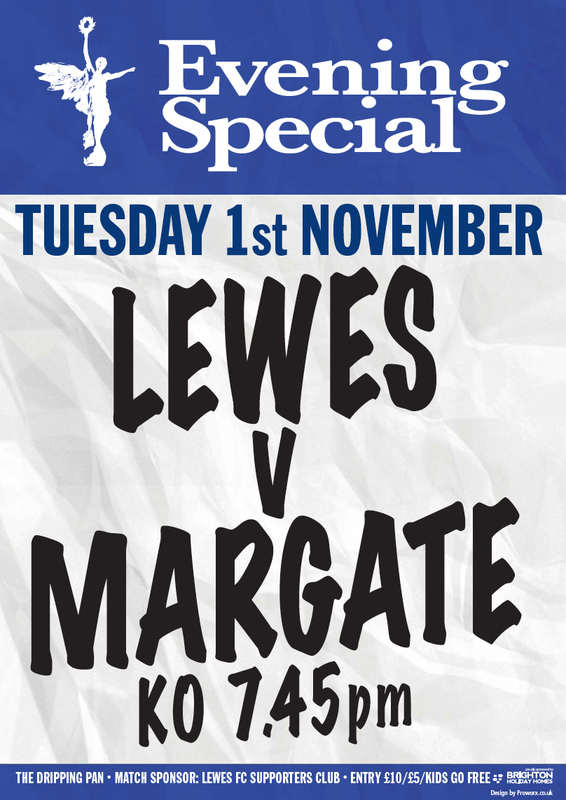 Perhaps it was also down to the fact we had banished our bad luck omen Legside Lizzy (Five Lewes games attended, one draw, four defeats) or simply that we had been better than a dogged Margate team who arrived at the Pan unbeaten away from home in the league. Two goals from unlikely sources were the difference between the teams on a distinctly autumnal night. Whilst Lewes had the better of the opening exchanges with King starting with three up front, they had difficultly beating a well marshalled Margate defence. The opening goal came in the 18th minute when full back Dominic Sterling stuck out a toe in a defensive melee and diverted the ball into the back of the net for his first goal in a Lewes shirt. At every game I buy a golden goal ticket (sometimes even treating myself to 2 if I am feeling lucky), and without fail they are always second half times. So far this season at the Dripping Pan only on two occasions has the opening goal come in the second period and one of those I wasn’t there for. After a chat in the board room at half time about the involvement of Buster at Margate (“Lovely man, salt of the earth. Liked collecting clothes peg dolls“) it was back on the terrace armed with a cup of home-made leek and potato soup. Harvey’s may well be just a stone’s throw away in the Rook Inn, but the sure sign of winter coming is when people swap the pints for the soup. Margate started the brighter of the two sides, stopping the ball getting to the Lewes front three. It was going to take something special to break them down, and that is duly what arrived when George “Bambi” Nicholas won the ball in midfield, looked up Hoddle-style and rifled the ball into the top corner. Bingo. Nanetti had finally arrived from his railway hell and made an appearance late on, just in time to see the linesman rule out a Curtis Robinson effort for Margate which would have led to some nervous last few minutes. “We love you Lino, we do” came the chant from the terrace – almost raising a tear to his eye. And who said the Respect campaign was dead. So three points and back up to third in the league was the reward for an industrious performance. His holiness, Lord Plumpton tweeted me “Congratulations on your first win.Hope you ride home in a jag with a blonde on each arm”…Alas it was Southern trains, with a cold sausage roll and a fat women massaging her corns. Maybe next time Jim. This entry was posted in Lewes FC, Non league football, Rymans Premier and tagged Dripping Pan, Lewes, Margate, Ryman Premier League. Bookmark the permalink.